CheckPrixa Image To PDF Converter is a free tool for converting image files to PDF. It is used by many companies worldwide to produce PDF files from pictures. As a fully capable converter, it is robust and is able to handle enterpise workload efficiently while delivering professional results. The tool includes an extremely simple user interface that allows you to produce results immediately upon installation. There is no learning curve and very little time wasted to find the optimal settings. Applications for this Image To PDF tool includes turning image scans of forms, reports and other standard sized documents into an e-book, or collating photographs into a nice catalog, or combining multiple screenshots into a step by step instructive manual. 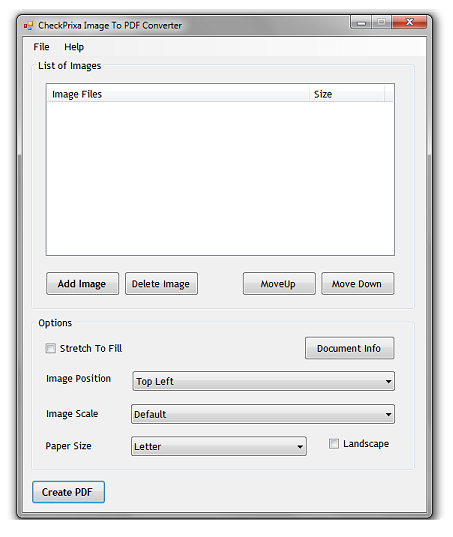 Turns image files into a single PDF file. Creates e-book from scans of physical documents. Produce a PDF catalog or album from photographs captured by cell phones or cameras. Deployed and used by many organizations throughout the world. Makes complicated conversion jobs a breeze. Accepts all popular image formats Png, Jpg, Gif, Bmp, Tiff. Flexible image scaling options. Image can stretch to fill entire page or scaled proportionally w.r.t. page size. Supports different page sizes, including Landscape or Portrait orientation. Insert meta information such as Author, Keywords and Subject. 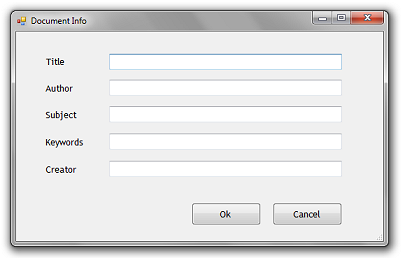 A user interface is provided for the selection, addition, deletion and ordering of image files. Formats supported include JPEG, PNG, GIF, TIFF and BMP. The tool works by creating a page for each image that it successfully reads. The page size is set to Letter as the default, and the orientation set to Portrait. An image is placed at the specific location of each page (either at Top Left, Bottom Left, Bottom Right , Top Right or Center) . 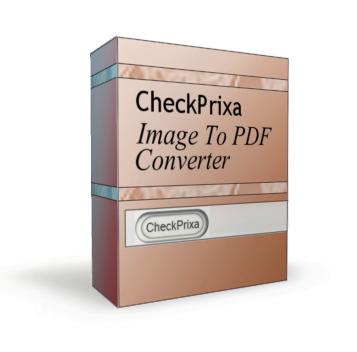 CheckPrixa Image To PDF Converter supports a wide variety of scaling options. By default, the image size is determined automatically from its original dimensions. However, the tool also supports other scaling mode such that the aspect ratio of the original image is preserved. 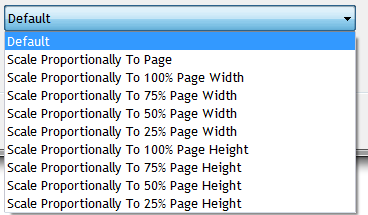 For example, the user may select to resize the image to (i) the page width, (ii) half the page width, or (iii) a quarter of the page width; or (iv) to the page height, (v) half the page height, or (vi) a quarter of the page height. Furthermore, the image may also be Stretched To Fill the entire page. Other capabilities include the entry of PDF document information such as Title, Author, Subject and Keywords. To produce the PDF document, the user simply needs to click the Create PDF button after selecting the image files and choosing a file name for the PDF document. .NET 2 Framework Runtime or later. COPYRIGHT (C) 2010 - 2018, IMAGE-TO-PDF.NET. ALL RIGHTS RESERVED.